Many people grow cyclamen as houseplants, but there are hardy varieties of these plants that look wonderful in the garden. They provide a splash of colour when there is little else blooming, usually in late winter and early spring. The flowers range from white, through pinks, to deep reds. The flowers turn back on themselves giving them a shape like a shuttlecock, or perhaps fairy wings. The heart-shaped leaves are a mixture of green and silvery white and add interest to the garden at the bleakest time of the year. These plants look wonderful grown on banks, rockeries or in a shady border. They can tolerate quite a lot of shade which makes them ideal for difficult, shady spots where little else will bloom. They can also cope with the dry shade under trees, one of the most challenging spots in the garden. Read on to find out how to care for and propagate these hardy winter gems. These plants like well-drained soil but are not fussy about soil type. They will do well even in relatively poor soils. When choosing your cyclamen ensure that you pick a hardy variety. 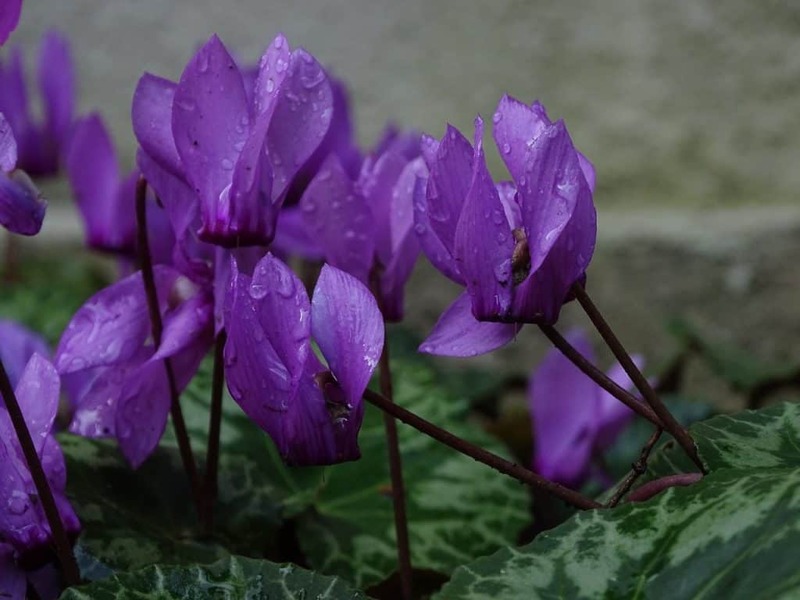 Those sold in garden centres and florists as house plants are usually the species cyclamen persicum and these tender plants will not survive outside. Hardy cyclamen is a tuberous perennial and it will spread itself by setting seed around the garden. There are varieties that flower in autumn, winter and spring. Most are hardy enough to survive a cold British winter, however, they will not survive in very waterlogged soil. Also known as ivy-leaved cyclamen or sowbread this is a robust species. It flowers in autumn and can tolerate very cold winters. It has pink blooms or white blooms tinged with pink and dark leaves with silver markings. Good varieties include ‘Nettleton Silver’, ‘Pewter Silver’, ‘Silver Arrow’ and ‘Silver Cloud’. This variety has heart-shaped leaves that appear in October and are followed by small, vibrant flowers in winter and early spring. It is a very hardy variety. This species comes in a range of colours from pure white to deep magenta and every shade in between. Good varieties include those from the ‘Pewter Leaf’ group whose leaves look like they are overlaid with pewter. The silver group (C. coum Silver Group) is also good, featuring a silvery coating so bright it is almost white. There are also good white-flowered varieties such as ‘Ashwood Snowflake’ which is pure white and, ‘Maurice Dryden’, which is white with a pale pink tinge. ‘Something Magic’ has violet-pink flowers while ‘Rubrum’ is deep pink with a purple blotch at the base of each lobe. This species flowers in March and has large pink flowers on stems up to 12 cm (5 inches) tall. C. repandum has heart-shaped leaves speckled with grey, and fragrant rose-red flowers. It is sometimes known as wavy cyclamen due to the scalloping on the leaf edges. This variety does not have a dormant period like the other varieties. This means it is always in leaf and will need to be kept moist throughout the year. It has deep magenta flowers and a sweet fragrance. Leaves are heart-shaped and marked with or washed in silver. It is very hardy. These plants are hardy and long-lived and require little care once established. They do not like to be disturbed unnecessarily so try not to move them about too much. Find them a spot of their own or let them share their space with spring bulbs or other shade-loving plants. They are small in stature and so suit rock gardens and alpine beds. The plants self-seed and will soon spread to surrounding areas of your garden. These plants do not like hot sunny positions and prefer semi-shade. If kept in a warm, dry situation they may be more susceptible to cyclamen mites and spider mites. Water these plants during their growing period if the weather is dry. However, take care not to overwater them, especially in their dormant period, as this can cause the roots to rot. In autumn and winter nature usually provides enough water for these plants, however, you should keep an eye on them if the weather is particularly dry. Hederifolium can manage well through even dry summers with minimal watering. Potted plants should be watered just as they almost dry out. Give them a good soaking rather than a regular sprinkle. These plants like a fertile but free draining soil. If you have sandy soil it is worth enriching it with some well-rotted manure or compost before planting. If your soil is heavy add some coarse grit as these plants will not tolerate sitting in wet soil. Once planted into a relatively fertile soil these plants do well without any extra fertiliser. A yearly mulch is enough to keep them well fed and to protect them from the worst winter weather. If your soil is poor or sandy, apply a low release fertiliser in spring. Cyclamen is usually bought in a pot but can be purchased as a tuber. Plant tubers so the top is just below the surface of the soil. Space them 15-25 cm (6-10 inches) apart. If there are no roots on your tuber it can be hard to know which way up to plant it. However, if you look closely you will see that one side has a growing point and this should be planted facing upwards. For the more saucer-shaped tubers, plant with the convex side downwards. Cyclamen look wonderful planted in containers. Choose a container with plenty of drainage holes and cover these with crocks to prevent them from becoming blocked. Cyclamen do not like sitting in cold wet soil. They often do best on their own and should not be overcrowded as this will encourage mould. Use a loam-based compost and add a slow release fertilizer in spring. Position your plant somewhere with good air circulation as this will reduce the risk of grey mould. Remove spent flowers to reduce the risk of mould. Grip the flower stem and twist it to detach the whole stem from the corm if possible. At the end of autumn, remove fallen leaves if they are thick, as these will prevent your plant from getting enough light. Do this by hand, rather than raking, so as not to damage the tubers which sit quite high in the soil. Container grown plants do not get very large so will rarely need repotting unless they are in very small pots. It is worth removing some of the soil from the top of the pots each spring and replacing it with fresh. Try to work around the corms when you do this so as not to disturb them too much. These plants look good with other winter and early spring flowering bulbs such as snowdrops, winter aconites, and fritillaries. Cyclamens also look stunning when paired with hellebores, primroses or trillium. They make good underplanting for shrubs and trees and are one of the few plants that will flower in these dry shady conditions. They also look good against a backdrop of ferns which will also do well in these conditions. Cyclamen do not require pruning or cutting back. Cyclamen will self-seed and so usually they can be left to their own devices and will spread to form an attractive colony. However, they can also be propagated by seed or divisions. If you are growing your plants from seed, you should soak the seeds in water for 12-24 hours before planting to help them germinate. The seeds can be planted directly into a well-prepared bed once the soil is warm in spring. Alternatively, the seeds can be started indoors or in a greenhouse in trays or modules of seed compost, ready for hardening off and planting out when the weather is warmer. If you wish to propagate your cyclamen by division, you should do this in autumn. Lift the plant and divide the tubers. Replant the divisions in prepared soil so that the corms are just below the surface. You can mulch the plants to protect them from the winter weather, however, don’t overdo it as the plant will need some light. An inch or two is plenty. The most likely problem you may encounter with your cyclamen is mould or rotting due to damp growing conditions and lack of air circulation. In warm, dry conditions such as a sheltered, sunny spot or in a greenhouse, pests such as cyclamen mites and spider mites may be a problem. When planted in a suitable place these plants are usually pest and disease free. Cyclamen mites are too small to see but you may spot symptoms such as yellow, deformed leaves. An insecticidal soap may be applied to get rid of these pests. These mites often thrive in hot, dry conditions so misting the plants with water may discourage them. Your plant may also be susceptible to spider mites, especially if kept in a greenhouse. These tiny insects are hard to see, though you may sometimes spot their webs. However, if you place a piece of paper beneath a stem and gently shake it you may see some tiny orange-red or green mites fall onto the paper. You can remove the mites with jet of water or by thoroughly coating the leaves with an insecticidal soap. These pests also like hot dry conditions so misting them may be appropriate depending on the conditions. It is often a case of finding the right balance for the weather conditions and planting situation of your cyclamen. Cyclamen is rather susceptible to Grey Mould (Botrytis Blight). This is a fungus that is often caused by too much water and too little air circulation. It starts at the base of the stalks and spreads to the leaves and flower buds. Remove and dispose of the affected material and improve the conditions of the plant by moving it to a place with good drainage and air circulation. Avoid overwatering the plants as this can significantly increase the chance of fungal diseases. Severely affected plants may need to be removed and discarded. Rotting of the tuber can be caused by Erwinia bacteria. It will cause infected the leaves to turn yellow and wilt. 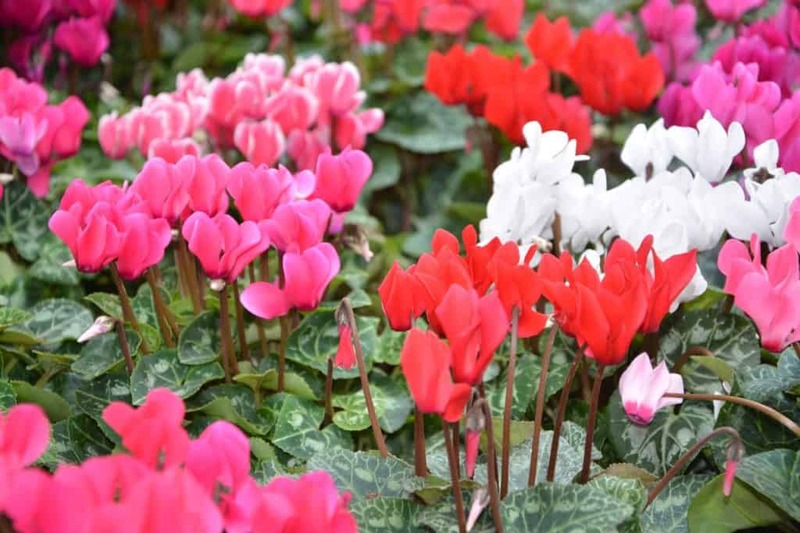 This disease is caused by planting the cyclamen too deeply or by overwatering or over fertilising. Affected plants will need to be discarded. Q My cyclamen seems to have died this spring. What might have happened? Q I planted some cyclamen last year but, though they produced leaves over winter and in spring, they haven’t flowered. What could be wrong? As these are quite young plants I imagine that they re just not quite mature enough to flower yet. You will probably get flowers next year and they will just keep getting better and better after that. Q My cyclamen have all gone mouldy and rotted. What did I do wrong? 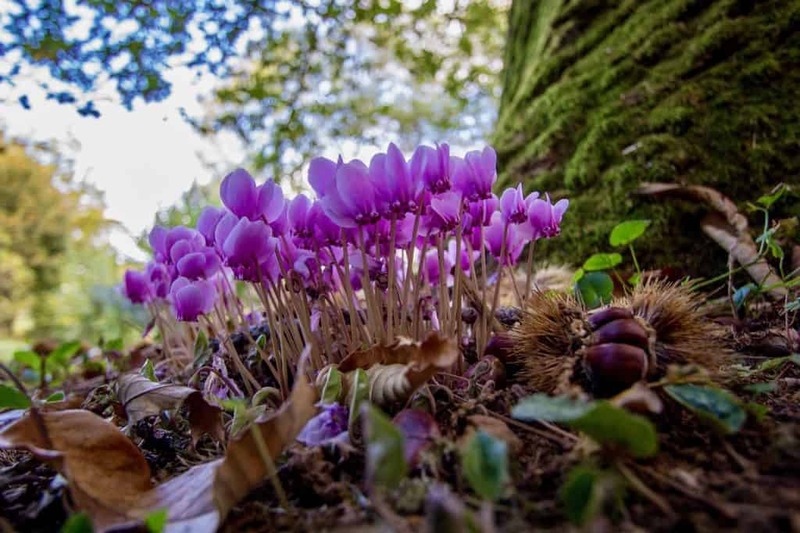 Most species of hardy cyclamen are native to the Mediterranean which means they sometimes struggle in our wet climate. Good drainage is essential. They are particularly prone to waterlogging in the summer. These plants are dormant in the summer months and require very little water at this time. Overwatering in the summer can cause the crowns to rot. Try to provide the conditions they like by ensuring good drainage and plenty of air circulation.